Decades after the military coup, micro-fascism still structures everyday life in Chilean society. 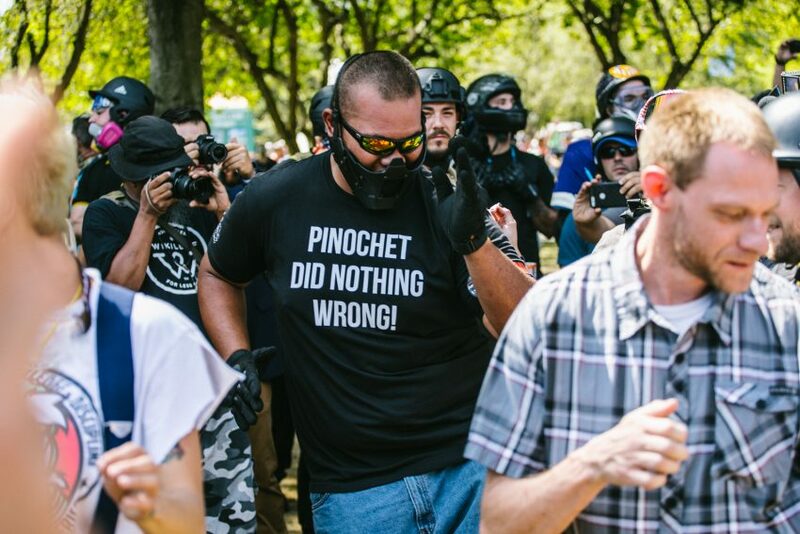 But the influence of the Pinochet regime is not only limited to the subcontinent, as a T-shirt with the slogan "Pinochet Did Nothing Wrong", worn by a neo-fascist in Portland, Oregon shows. In this article, Oscar Cabezas tries to understand how an inept dictator is turned into an icon of xenophobia, racism and anti-communism, and argues that this is enabled by the erosion of the public space of politics, and its disconnect from the values that democracy supposedly promotes. This article was translated from Spanish by Nicolas Allen. It has become commonplace among certain strata of Chilean society to speak of the “positive balance” inherited from the Pinochet regime. However, for the country’s subaltern classes, its social movements and indebted students, that legacy rings hollow. For them resistance is the order of the day: resistance against a phenomenon that today finds echoes in neo-fascist rallies in far-flung Portland and Brazil; closer to home, they are faced with a form everyday micro-fascism whose grip on Chilean society inevitably harkens back to the terror of the dictatorship. Portland, Oregon: the shirt reads “Pinochet Did Nothing Wrong”. One is tempted to transform the overt cruelty of that sentiment into a question: what exactly did Pinochet do to deserve his induction into the halls of “extreme liberalism”, i.e. neoliberalism? In short, Pinochet’s virtues are not fascist in the traditional sense: he never won an election, was never a charismatic politician. An ignoramus, he could hardly manage a coherent sentence. His “merit” consisted in commanding a terrorist state that laid to waste the democratic socialist project of the Popular Unity government; for having applied bloody torture methods and forced disappearances for over 17 years, laying the groundwork for an illegitimate constitution that, to this day, holds the country captive in a dictatorial holding-pattern. The “phantom dictatorship” inaugurated by the 1980 Constitution, which enshrines the liberal program of present-day Chile, includes a clause in which the military can intervene in national political affairs. These are the same Chilean Armed Forces that count the 1973 coup as one more victory in the illustrious history of uninterrupted military triumph. During the current period that constitutes Chile’s authoritarian democracy, every center-left democratic government, from the Concertación (1990-2010) to the Nueva Mayoria (2013-2018), has failed to cohere into a political force capable of realizing the type of structural change that would rid Chilean society of its lingering “Pinochetismo”. That legacy has now raised its head in Portland, Oregon, on the t-shirt of a neo-Nazi advocating for the type of racial, political and social hatred that sustains the myth of White America. A reading of that slogan –“Pinochet Did Nothing Wrong”– could provide a useful object lesson for the moral corruption and naturalization of cruelty that enjoys increasing currency in our “globalized societies”. On the one hand, that torture and forced disappearance could be so naturalized that a group of young, white, middle-class men would voice their support for such crimes against humanity, this itself suggests the total dissolution of “democratic values”. On the other hand, that one of the Southern Cone’s most brutal and inept dictators should be lionized as an icon of xenophobia, racism and anti-communism speaks volumes about the public space of politics and how that space has lost all relation to the values that democracy purportedly promotes. Unless, of course, one is willing to admit that democracy and human rights violations maintain a recondite connection. Read symptomatically, Pinochet’s canonization as an anti-communist crusader also underlines the failure of our liberal-democratic horizon to act as a retaining wall against the escalating violence of neo-fascist groups. Liberal democracy –failing to address class inequality and the arbitrary modes of wealth accumulation– is the privileged channel through which neo-fascism mobilizes, as Freud would say, the discontents of civilization. At once allegorizing Pinochet’s genocide and expressing the culture of extreme rightwing groups in the United States and across the globe, the t-shirt is the symptom of a left-liberal culture that has failed to propose any “worldview” that can counteract the “everyday fascism” that Foucault regarded as proper to our societies-of-spectacle, a kind of fascism decidedly less interested in its articulation within the nation-state. This everydayness on display in Portland is now reaching terrifying proportions in Brazil. Nowadays in Chile it can be found among reactionary groups that follow in the footsteps of Patria y Libertad (Fatherland and Liberty Nationalist Front), a group famous for its efforts to combat Salvador Allende’s democratic socialism. And while the historical context has changed, these groups have not disappeared. Under neoliberal president Sebastián Piñera, Chile has even witnessed a re-articulation of these tendencies with state institutions: see, for example, the municipal government controlled by the rightwing mayor Evelyn Mattei, who has unleashed a crusade against Chile’s most dispossessed sectors, seeking to eradicate their tenuous means of survival in the informal economy. Rightwing reaction to the Popular Unity government bears more than a passing resemblance to neo-fascist groups seen today in the United States and elsewhere. Patria y Libertad expressed the same nationalistic and xenophobic ideologies, the same willingness to resort to violence, and murder, against those who opposed them. Nevertheless, Patria y Libertad’s thuggish practices must be understood within the optics of Cold War anti-communist politics, its coordinates bounded by the conflict between the USSR and the United States. By contrast, the open xenophobia and racism of postwar neo-Nazism takes place in the context of post-national societies, where the defense of the nation is mobilized for rhetorical effect. Better, neo-fascism today functions as an extremist fringe whose ultimate purpose is to buttress market freedom. Hence, the canonization and vindication of an otherwise indefensible reactionary figure associated with the neoliberal rightwing. Or, put differently, neo-fascism represents the extreme wing of those who, defending the myth of the “Chilean economic miracle” (like those now defending the “Brazilian economic miracle”), see fit to justify not only torture and the use “death flights” to dispose of political opposition (“communists”), but also the application of genocide in the name of liberal democracy. Until recently, it seemed unlikely that such reactionary forces could come to power through electoral means. It has become increasingly clear, however, in light of recent events in Brazil and elsewhere, that the proliferation of these groups and their collusion with rightwing political forces is on the agenda because, in the last instance, they are a vital component in the defense of the globalized program of neoliberal politics. Forty-three years after the military coup, a t-shirt in Portland, Oregon, depicting communists plunging to their death, is evidence enough that the name Pinochet has lost much of the weight and significance it once carried during the conflict-ridden height of the democratic transition. As many will recall, Pinochet lost the plebiscite in the historic NO vote of 1988. At the time he could still count on the support of 44% of the Chilean population. That support waned as its citizenry began to awaken to the nature of the genocide that had eliminated Allende’s constitutionally elected government, although Pinochet’s iconographic status would only be laid to rest in the famous Riggs Bank case. Diverting attention from the atrocities committed, the case recast Pinochet as a “kleptocrat” who had embezzled public funds and possessed millions in accounts held under false names. Large parts of the Chilean right were displeased with this new development: the Riggs case had effectively reduced Chile’s neoliberal military hero to a common thief. That being the case, a lack of political and legal proceedings has allowed Pinochet’s malfeasance to go unpunished, a problem, it must be said, befitting an alienated society more concerned with going to the mall (some of which were erected on the former site of clandestine torture centers) and battered by the lack of basic social provisions – health, education and housing – that could protect the poorest members of Chilean society. Chile has never overcome the historical trauma produced by the coup. The genocide visited on civil society between 1973 and 1989 was not only negotiated between rightwing and centrist parties like the Christian Democratic Party, it was overseen by the approving eye of international powers: Richard Nixon and his advisor Henry Kissinger. The traumatic repercussions of the dictatorship are not merely psychological, nor can they be rectified through a policy of memory and remembrance. Among the dead, disappeared, tortured and exiled there are 40,000 victims of the Pinochet regime. The dictatorship’s combined effects on society are irreparable: if there are neo-Nazi groups today, similar to those in Portland, this is because everyday fascism considers them superfluous. In Chilean society, the micro-fascism that periodically reveals itself, other times concealed, is the dominant structure of the everyday. The “economic miracle” associated with Pinochetismo has erased virtually any kind of political imagination that would take as its minimum consensus a commonly shared social coexistence. Everyday fascism works through exclusion, by reproducing an internecine warfare among social classes that are structured and rigidified by post-dictatorial Chilean society. Meanwhile, the traditional left has little to contribute in the debate over the partition of the commons, and much less over the nature of the nation-state as it exists in a post-national and globalized scenario. Nowhere can one find an example of a citizen-driven program for co-existence that is not framed by the hedonistic imperative to consume, with its ultimate goal of catering to the wealthiest fraction of society. This same political rationale has recently provided the driving animus for a discriminatory and racializing attack on immigrants (Chile has recently become the region’s major port of call for immigrants); arriving with little money, the Haitians, Afro-Colombians, Peruvians, Bolivians are the symbol of a frustrated and otherwise purloined citizenship, a living emblem of the cancellation of Latin America’s emancipatory imagination. Particularly where the Haitians are concerned, the Chilean left seems to have forgotten that this Third World country was responsible for one of the continent’s first and most radical independence movements of the 19thcentury. The destruction of the public sphere in Chile is inextricable from the erosion of social spaces nurtured by the socialist and communist imagination, whose roots can be traced to Salvador Allende’s project. According to that vision, the public represented an idea of co-existence among human beings who recognize themselves as inhabiting the same commons. Allende’s program envisioned the equitable repartition of socially produced wealth and the inclusion and recognition of indigenous populations within a pluralist and inclusive nation-state. Although not without its own forms of inequality, the Popular Unity government was at essence a project for coexistence and the closing of the social gap. Pinochet exterminated any possibility of imagining a meaningful form of co-existence based on the commons, and with it, he buried the Chilean left, which has never since managed to transform its tragic figure into a program capable of opposing everyday fascism and reviving the political imagination that the present so clearly needs. The Chilean middle class is the bulwark of this order, the opium neutralizing any kind of insurrection that could divert Chilean society from its current course. The socialism that the left once knew is today a museum piece, because the left itself has simply withdrawn or been domesticated by a vision of politics as the “art of the possible”. And the possible is clearly delimited in the fraudulent 1980 Constitution. Today, those on the Chilean left who might still recall Allende’s call for a socialist revolution “with empanadas and red wine” are asleep in government posts, bereft of any capacity to imagine a different world. All the while, neoliberal society flexes its muscles as the dawning of everyday fascism reminds us, as it did in Portland, Brazil, and elsewhere, that the left still lacks the capacity to imagine a hegemony based on a new culture and a new anti-fascist front.